Willow Aster, pattern number 9843, an example of which is shown below. Shown here is the underside of the compote, also printed in the Persian Spray pattern. Shown here is an earthenware oval platter printed in a second version produced by Doulton with the Willow Aster pattern, pattern number 9843. In this version, only the border pattern was used. An earthenware scalloped compote printed in flow blue with the Persian Spray pattern. A dark blue ground was added to the border with circular reliefs containing geometric patterns alternating with others containing the Willow design. Floral sprays are added both to the border and the center. These designs are repeated with over the glaze gild decoration. 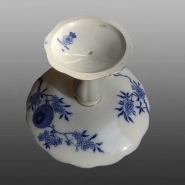 The piece was also printed on the underside of the compote (see the additional image below). The pattern name is printed with the mark. The Doulton crown marks were used from 1882, and with the word "England", as with this example, after 1891. During the same period, Doulton also produced a variation of this pattern known as Willow Aster, pattern number 9843, an example of which is shown below.